This is the standard curtain heading and gives a nice gathered effect. Suitable for most widths and lengths of curtain and for the full range of window spaces. Double pinch pleat curtains hang in columns and will emphasise the height of your room. They will require a greater width of curtain fabric than the standard pencil pleat heading. Metal or plastic eyelets are pressed onto the fabric which are then threaded over the pole. 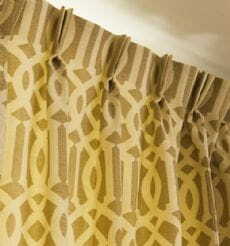 This type of heading allows the curtains to hang in neatly defined folds, creating a sleek and streamlined look. The actual eyelets come in a range of metallic finishes and colours. I can source these for you. Triple pinch pleat curtains as you might expect operate on exactly the same principle as double pinch pleat but require more fabric again. 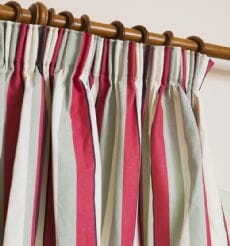 Tabs are attached to the top of the curtains which loop round the curtain pole to give a stylish look. The tabs can be made out of the same fabric as the curtains or a contrasting fabric. A variant on this is the Concealed Tab Top where the tabs are attached behind the fabric giving a very neat, streamlined finish. This type of heading gets its name from the pleat which is shaped like a wine goblet. It requires a similar amount of curtain fabric to the double pinch pleat option. 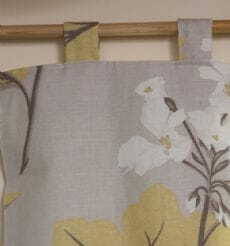 A Tie Top Curtain Heading works along similar lines to the tab top ties instead of tabs are attached to the top of the curtains and tied around the pole. This gives curtains quite an informal look. If you see a curtain heading which is not contained in the above list, then if you can describe it to me, or better still take a photo or provide a picture, then I will do my best to re-create it. If you would like any advice on the best type of heading I would be happy to help.